Who should consider the laser removal of tattoos? At the very beginning, it is worth noting that getting rid of a tattoo is not a one-time treatment but a complex process where the dye pigment is gradually removed. It all depends on the method of performance, size, depth, colour(s) of the body drawing (amateur, professional) as well as the skin complexion. It may require from few to even several appointments. Each treatment allows you to lighten the pigment by 20%, while amateur tattoos are easier to remove. The body needs at least four weeks to absorb the laser-broken pigment particles. 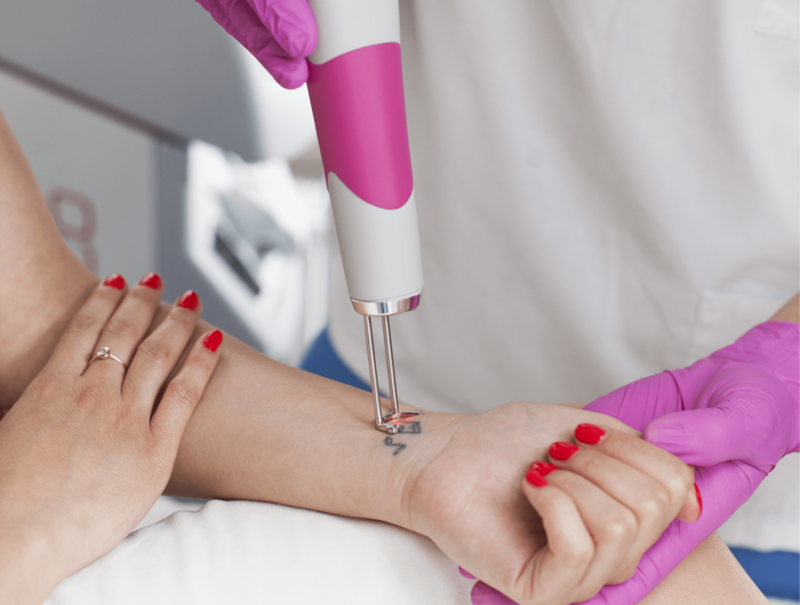 It is also worth noting that not every tattoo can be removed successfully- the doctor will inform the patient about the possible effects during performing the treatment. The most easily removable tattoos are those that consists of black, grey, graphite and red colours. The lighter colours- especially yellow and orange are harder to remove. Patients frequently want to remove amateur tattoos, made carelessly, using unprofessional equipment and skin-damaging technique. It is also advisable to remove of tattoo when they cause allergic reactions or when they badly react to the sun (uneven intensity of colours). The patient has to see the specialist before the treatment. During the medical consultation, the patient’s skin reaction to the laser beam is tested to determine its optimal power of the laser. During a short treatment, the laser beam breaks the pigment into small particles which are absorbed thanks to the phagocytosis process. The patient does not feel any pain at all, only light burning. The skin is cooled with gels, cold air or a special tip in the laser in order to provide the protection. After the treatment the patient may notice on the skin: scabs, swelling, redness that disappear spontaneously after a few days. However, there will not be any scars after the treatment.